A group of LGBT activists hosted an unofficial, unapproved Pride parade in St. Petersburg, Russia today when several of the participants were attacked by anti-gay protesters. 14 people, a mix of LGBT activists and their attackers, were arrested by police. 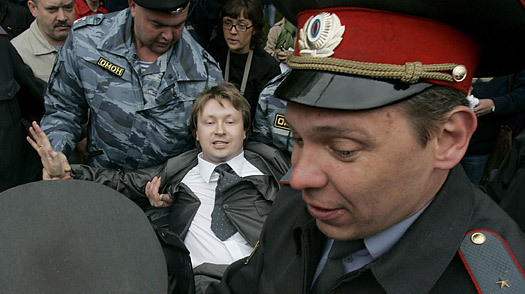 Among those arrested was Nikolai Alekseev (right, photo from one of Alekseev's earlier arrest), the man who has positioned himself as somewhat of a leader in the gay rights movement in Russia. He has since been released but his tweets from the day reflect the events as they occurred. Attempts to hold gay pride rallies almost always end in violence in Russia. Authorities habitually refuse gay rights activists their constitutional right to assemble, particularly in Moscow, on the grounds that other people find it offensive. "I've seen a lot of things in six years of holding such events in Moscow, but I've never seen such cynicism in St. Petersburg," said Nikolai Alekseyev, Russia's highest profile gay rights activist, who was himself briefly detained Saturday. The activists in St. Petersburg held their protest beside a monument to city founder Peter the Great, "because Peter the Great founded a city with European values," said Yuri Gavrikov, head of the Equality group. The full live blog about the situation is available at Gay Russia, and UK Gay News has extensive information about the incident. UK Gay News reported today that all 14 of the people arrested were LGBT activists. They were charged with organizing an illegal public action and "disobeying police orders," although video from the demonstration does not indicate any disorderly conduct. All 14 were released this afternoon with a small fine. However, they must return to court next month to address the charges of "disobeying police orders." The unsanctioned gay rally lasted only a couple of minutes. The signal was given when a boat covered with a rainbow flag passed on the Neva river in front of the Statue to Peter the Great which was the meeting point announced at a press conference a day before. At 2pm, the activists came out around the Statue and started to unveil banners and flags shooting slogans "No to homophobia" and "Equal Rights". A poster carried by transgender activist Anna Komarova read "Trans Rights are Human Rights", another one playing over the rumours that the city governor is alcoholic said "Alcoholism is a disease, homosexuality is not". Russia has never permitted a Pride demonstration. Just last month, a Pride celebration in Moscow turned violent and also resulted in the arrest of several dozen participants. I literally just saw a documentary at Frameline called "East Bloc Love" mostly about attempts to have a Pride event (it's so repressive they really can't have a parade) in Minsk, Belarus. It lasted 10 minutes before they were busted. The one bright spot in the film is when they held EuroPride (a rotating Pride parade) in Warsaw... which was the first larger Pride parade held in former eastern block countries. I don't really have anything to say about the repression because stories about that speak for themselves, and show how far we have to go in the former Soviet bloc. I think it's kinda strange, though, that the event is called Slavic Pride. If that isn't some kind of mis-translation, that name would seem to discriminate against St. Peterburg's non-Slavic LGBT people, who have to exist in significant numbers.